American oil production is reaching all-time highs. In 2018, producers pumped more oil than any other country in the world — including Russia and Saudi Arabia. But shares of producers and service providers don’t reflect this. Most investors are familiar with big energy producers like Exxon Mobil Corporation, Royal Dutch Shell and BP. These stocks are just off their lowest prices in years. But there is another sector that is even more hated than energy producers right now: oil service companies. The oil services are the plumbers of the oil industry. These companies drill the wells, run the pipe and service the infrastructure. They are the companies that constantly refine fracking technology. Those improvements led to America becoming the leading energy producer last year. Without these service providers, the U.S. oil industry wouldn’t be the world leader that it has become. But now, like the major oil companies, the services sector is even more beaten down. The VanEck Vectors Oil Services ETF (NYSE: OIH) is at its lowest price since 2004. That’s a huge fall from grace. The exchange-traded fund (ETF) fell 74% from its peak in 2014 to December 2018. Ironically, that’s due in part to their own success. Fracking was just starting when oil soared above $100 a barrel in 2011. Fracking was expensive, but with high oil prices, it didn’t matter. The price of oil covered costs. Producers spent enormous sums of money to pump more oil while prices skyrocketed. That period of high prices changed the course of U.S. oil production. By mid-2011, it was clear that the long decline in U.S. oil production had ended. The chart below shows the progression of U.S. oil production thanks to fracking. As we can see from the chart, oil production began to grow in 2011. By the middle of the year, it was clear that fracking was working. 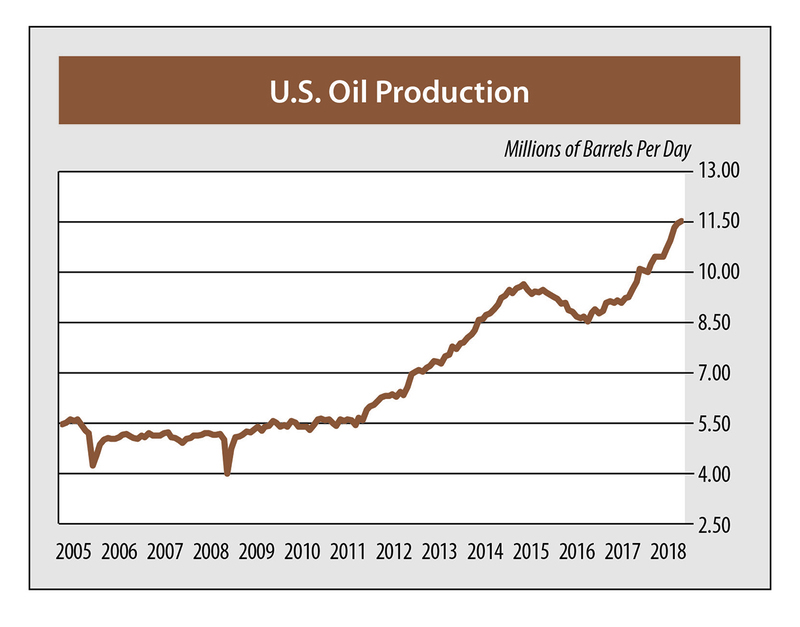 U.S. daily oil production jumped 110% from January 2011 to October 2018 — the latest data available from the Energy Information Administration (EIA). However, as I said, that success led to its undoing. The shale revolution threatened the global oil power structure. OPEC, led by Saudi Arabia, understood the implications. With the advent of fracking, America’s oil basins were awake once again. OPEC engineered a plan to kill off American oil producers. The plan was simple and effective — flood the market with cheap oil to make the producers unprofitable. Unlike most of the OPEC countries, U.S. oil production is market-based. If the price gets too low, companies will go out of business. The shale revolution relied on debt. That played into their hand. Bankrupting oil producers would clear the stage of competition and leave OPEC with the power to fix energy prices how it saw fit. While the collapsing oil price hurt producers, it forced them to innovate. They put the pressure on service providers to cut prices and become more efficient. The industry got lean, got smart and ushered in fracking 2.0. This renaissance in technology saw drillers that looked more like they belonged in Silicon Valley than West Texas. At the EIA’s conference last June, Stephen Ingram, the vice president of Halliburton, explained the breakthroughs in shale technology. Artificial intelligence and sensitive underground mapping both guide engineers to the most productive oil deposits. Service providers slashed the cost of fracking. After the modernization of fracking, most producers need to see oil around $50 a barrel to turn a profit. That’s much lower than most of the OPEC countries’ breakeven price. The EIA predicts that oil will average $61 in 2019 with a slight bump to $65 in 2020. The agency sees these prices being high enough that producers boost production. That’s why we’re bullish on the oil service sector right now. The VanEck Vectors Oil Services ETF (NYSE: OIH) is 22% lower now than in early 2016 — when a barrel of WTI was just $30. If you are looking for a great speculation for 2019, that’s the sector to start with.